Speakers and members of the World of Wellesley (WOW) board in attendance. 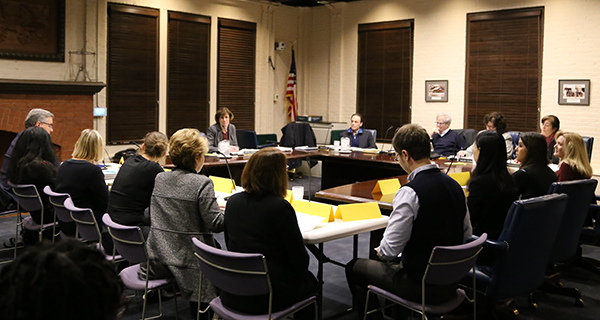 On Monday, January 14, a panel of eleven community leaders and members addressed the Wellesley Board of Selectmen in an open meeting to discuss the state of diversity in Wellesley. Speakers covered topics ranging from diversity initiatives in local schools, the difficulties of assimilation facing immigrant families, local programs to help non-English speakers learn the language, and diversity programs and organizations already in place in town. A full crowd sits in attendance at the meeting in Town Hall. Addressing the board were David Lussier, the Superintendent of Wellesley Public Schools; World of Wellesley (WOW) President Michelle Chalmers; Elaine Bannigan of Pinnacle Residential Properties; Elizabeth Shang, an English-Chinese interpreter for Pinnacle; Senior Pastor Sarah Sarchet Butter of Wellesley Village Church; Director Jamie Jurgensen of the Wellesley Free Library; Director Karen Evans of the library’s English as a Second Language Program, along with three students of ESL, Ruslan Mikhailov, Mary Qin, and Lilia Diaz; and Jerry Lu, president of WeCan (Wellesley Chinese American Network). Jurgensen and Evans then described the library’s robust English as a Second Language program, driving the point home with readings from three of their students who spoke powerfully - with heavy accents, but in perfect English - about how the ESL program has changed their lives in Wellesley. Finally, Jerry Lu introduced the launching of the WeCan, which will be a resource for Chinese American’s in Wellesley and the greater Wellesley community to connect and work together. 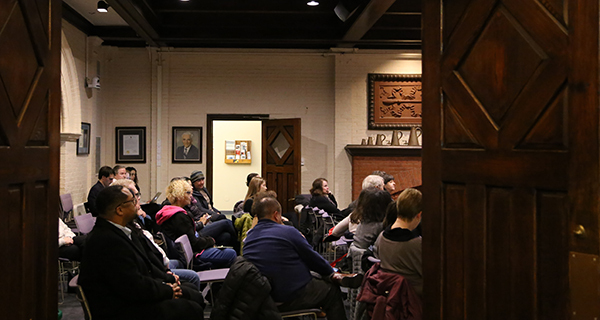 Members of the community are welcomed to participate in further discussion about diversity by joining the World of Wellesley at the Community Center on February 26 at 7 p.m.